In 2005, Brandon Sanderson debuted with Elantris, an epic fantasy unlike any other then on the market. To celebrate its tenth anniversary, Tor is reissuing Elantris in a special edition, a fresh chance to introduce it to the myriad readers who have since become Sanderson fans. This new edition begins with a preface by author Dan Wells, the first person to read the completed novel, and a new afterword by Sanderson explaining how he came to write the book and its place in the Cosmere, the unified universe of all his Tor novels. Also included is an expanded version of the "Ars Arcanum" appendix, with more of the technical details of the book's magic that fans can never get enough of. 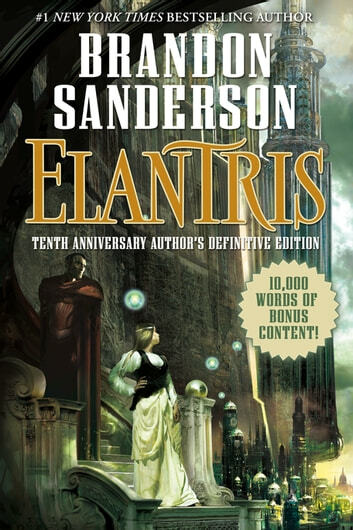 Elantris was truly a milestone both for Sanderson and for the genre of epic fantasy. It deserves this special treatment, something Tor has done only once before, with Orson Scott Card's Ender's Game. Sanderson fans old and new will be excited to discover it. I gave this book a 4 star review only because I have read Brandon Sanderson's most recent work, and this being one of his earlier works doesn't quite stand up to the high quality novels and novellas he's put out since. The story itself is gripping and fast paced (something many fantasy authors struggle with though Brandon Sanderson seems to have side stepped that long winded hurtle) and the magic system is very interesting. On the downside I felt that characters were at times a little one dimensional and a little unbelievably good or unbelievably evil. While it might not be as good as Mistborn: The Alloy Of Law, The Emperor's Soul or the fantastic The Way Of Kings, it is certainly worth a read. For those new to fantasy or new to Brandon Sanderson this is a good place to start. Those familiar with his work may not enjoy this issue as much as some of his other releases but will likely appreciate it for the fact that it will allow them to see an author grow over time. Sanderson is the new master of fantasy. By far and away the best writer today. This is his first novel. While not as strong as his later work, it's still a very good book. Interesting premise and fast paced. Like all his books the characters draw you in. His worlds are very well thought out and his stories have great structure. An excellent first effort from a great writer. Sanderson has gotten me back into fantasy novels again. Good easy read! It had a refreshing twist on the usual court/religion/love story. I was pleasantly surprised by this book. It has strong male & female characters that balance each other very well. The premise behind the story is well thought out & lots of clues to the mystery are sprinkled through the book. The enemy monks are left a bit sketchy. I would have liked a bit more background on them. But overall I really enjoyed this book.